Professional Photographer NYC shot of new york city special event. 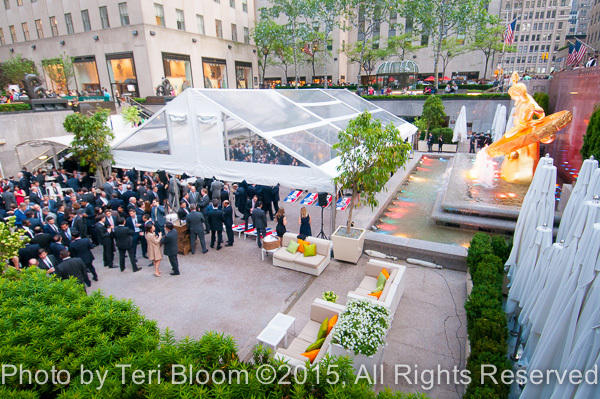 Rockefeller Center is one of the coolest places in NY City and what a place to have a corporate event! This photo is an overview of a party thrown by a non-profit to raise money for medical research and was attended by over 800 people. For anyone who’s not been to Rockefeller Center, in the winter this space transforms to an ice skating rink while in the summer its often used for special events. Its one of the largest and coolest venues in the city for large parties like this one. Also if you’re visiting New York City around Christmas, be sure to stop here and see the beautiful Christmas tree, you’ll never forget how majestic it looks!